You can either read through this or, if you’re more the visual type, jump right to the end of this post where I prepared a little video that guides you through the steps I outlined in the following 750 words. The files are comma separated but use dat as file extension. Normally not a big deal (and Tableau can read them) but to keep things clean I personally prefer to rename them to csv. "Airport ID","Name","City","Country","IATA","ICAO","Latitude","Longitude","Altitude","Timezone","DST","Tz database time zone","Type","Source"
"Airline","Airline ID","Source airport","Source airport ID","Destination airport","Destination airport ID","Codeshare","Stops","Equipment"
This is the critical bit. Or as I like to put it: This is where the magic happens. We’re going to do a union. Actually a self-union. And a join. And we’ll use Join Calculations! Get ready for some data prep right inside Tableau. Connect to the file routes.csv. Note how this automatically adds a new generated field [Table Name] – we will need this in the next step. This will look for the records that came in via the second instance of file routes.csv, as those show the string routes.csv1 in the field [Table Name]. If that’s TRUE we want the [Path ID] to be 2 (the end of our lines) otherwise 1 (vice-versa the beginning of our lines). Join with file airports.csv. The join will not use a regular join condition, but the Join Calculation feature we introduced in Tableau Desktop 10.2! It doesn’t really matter at this stage, but just to be safe, make sure it’s a left join. 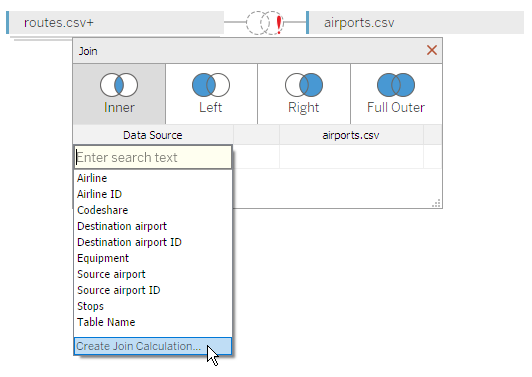 The Join Calculation will have to match the field [Airport ID] from table airports.csv. In order to exclude routes that don’t have matching airports as well as airports that don’t have routes assigned I suggest opting for an Inner Join here. This will later allow us to plot lines from the latitude/longitude of the source airport, coming from [Source airport ID], to the latitude/longitude of the destination airport, coming from [Destination airport ID], using [Path ID] to draw from source ([Path ID] = 1) to destination ([Path ID] = 2). That’s the result we’re looking for, but it’s still a bit of a mess. Therefore let’s set the Size of the lines to the minimum and change their opacity to 10%. You can do both changes by clicking directly on the Size and Color cards, respectively. 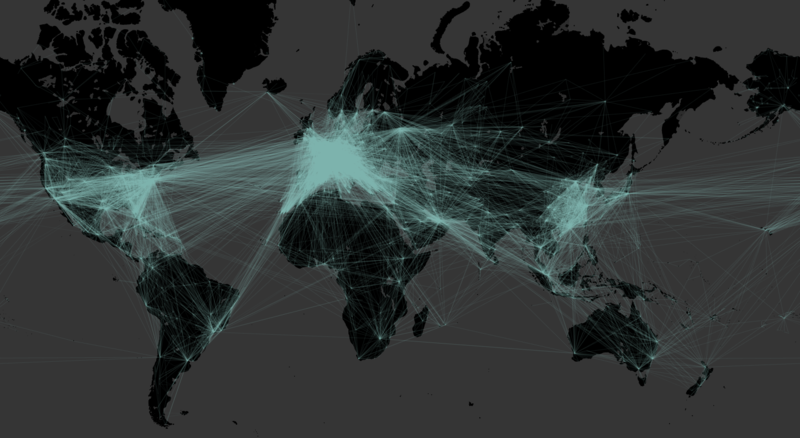 You just built a very cool dataviz showing all the flight connections between airports worldwide. Now get creative. A fun idea is to check the route network of your favorite carrier: Just show a filter control for the dimension [Airline]. Or filter for all routes that are served by your favorite aircraft type. This one is a bit tricky, but I’m sure you can do it. Hint: Use the dimension [Equipment] and some clever string functions or wildcard filters. Many thanks for sharing, it helps a lot. You’re welcome! I’m glad it made sense to you and helped you do what you’re trying to achieve.